The manufacturers of XIX-th century tried hard to return their more and more attractive dolls, joints of bodies, more and more luxurious clothings, search for expressions of the face the most close to the reality and to the life. They were short only of speech. Ingenious inventors were used to it. 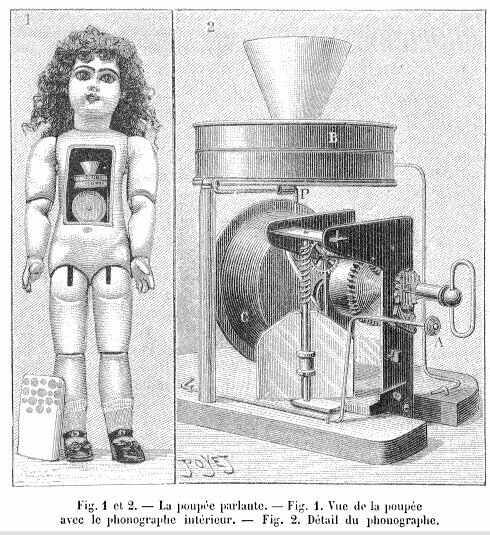 Marie CRUCHET (said "Père CRUCHET", because it was an ancient sailor of Trafalgar, reconverted in the manufacture and the repair of toys and automatons) had the merit to simplify the system of bellows (Patent of August 29, 1855), decreasing at the same time the cost price of the mechanism and the volume of this one. Across the Rhine, the manufacturers were not out done : In Sonneberg, Christophe MOTSCHMANN, " bossierer " (" Worker in bosses ", modeller, manufacturer of objects in " pâte à sel ", pulp...), in 1857 , a patent for a mechanism saying " Dad ", " Mom ". Two threads allowed to act on eyes or voice. Jules-Nicolas STEINER took in 1862 a patent for an " Automatic speaking Baby ", saying either " Mom ", or " Dad ", following that it lies or up. (The other authors indicate when the Baby was up it said " Dad " and " Mom ", and lamented when it slept. The two models were able to exist). Working was assured with a spring. 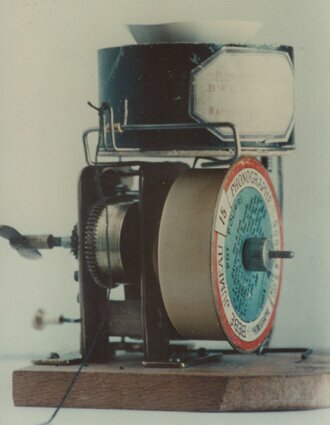 In 1863, taken a new patent for a speaking mechanism was taken with threads this time. 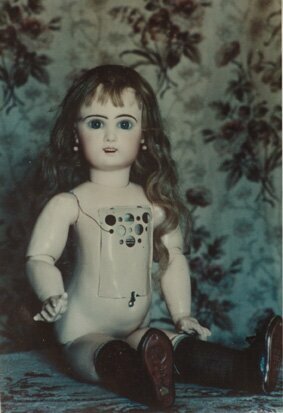 Before 1870, the doll speaks with bellows and to the cordon placed in its body, generally in its womb. By pull down the cordon, one activates the bellows, provoking so mechanical words. The firm BRU follows movement and puts deposits in 1867 a patent for a " Striking Doll ", and in 1872, a patent for a " Baby surprise " containing a musical mechanism. Until then, the voice was not reproduced, but synthetized, more or less skillfully, more or less simply , by the passage of compressed air ( by a pear-douche, a bellows, a piston in a cylinder..... moved with thread, a spring...etc.) on an anche, or a membrane, or an association anche and pavilion with variable opening. With the invention ( et us say the "adjustment" of Charles Cros's invention in april1877 ) of EDISON, the voice was going to be recorded and reproduced and either " made ". In the first machine, in December, 1877, Thomas Alva EDISON used a sheet of tin, not very musical. Hearing is improved by Charles Summer TAINTER who replaced this sheet by a cylinder of cardboard coated with wax. In 1888, William W. JACQUES, American citizen, gave up to Edison Phonograph Toy Manufacturing Company a patent associating doll and small phonograph. Reading the issue of April 26, 1890 of the review "Scientific American". 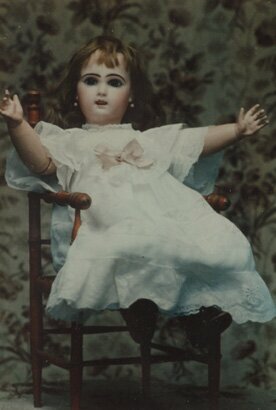 In 1889, 500 talking and melodious dolls, would have been produced per day ! These dolls were assembled in West Orange ( New Jersey) with Simon & Halbig heads (Mould 719) or Heubach heads (Mould 224). They measured 22 inches (about 56 cms). Their success was very reserved : The cylinder covered with wax wore out quickly and was not removable. The set was rather fragile. On ten thousand dolls which would have been assembled, five hundred only were sold complete and almost five hundred were sent back by the disappointed buyers. But the talking doll Edison had a big merit : To appear among phonographs in the Stand of the Exposition Universelle of 1889 in Paris. Emile JUMEAU noticed this invention, already told with articles appeared in " L' lIlustration " and in " La Nature ". Wanting to assure the constant ascendancy of his firm, it is necessary put in his catalog of the Babies who speak really. He turns so to a watchmaker of big talent : Henri LIORET. ( In 1866, he is, in 18 years, the first of the promotion at the School of Besançon's Watch-making). Having opened the own clock maker's, he is known for the creation of a watch alarm clock " the Cricket ". He realized also, to order governmental, a clock offered to the Czar. This one liked the wager which was subjected to him : to create a phonograph-doll, being able to be put between hands not always skillful of girls, of better sound quality than those existing, and not to be in the field of patents already taken by the competitors. He had then the idea to perfect not the mechanism even, but the process of recording. Because the cylinder covered with wax wears out too fast and can not be copied, he directs the searches on the realization of cylinders exchangeable and able of resisting in childish enthusiasms. A first patent ( n°230.177 ) is put deposited on May 18, 1893, aiming to cover perfections bearing " first of all the construction of the cylinder or roller intended to receive the carving. " From a steel muff one obtains by copies of the steel cylinders also. On November 28, 1893, he takes an addition for the initial patent, for an original method of duplication of the recorded womb, which allows to produce celluloid cylinders in series, less fragile and less subject to the wear than the wax cylinders. Reproduction in series cylinders had a big advantage : It allowed a single " grip ", the one that realized recording by engraving the soft iron womb. At the beginning of the wax cylinders, each of them must be recorded. Ten or hundred talking dolls required that is repeated ten or hundred times the same words, from that risks of hoarseness. It is reported that Kammer und Reinhardt, who exploited the gramophon with discs ( and not with cylinders ) of BERLINER had engaged a famous baritone, who at the end, victim of hoarseness, began cawing pitifully, got excited and threw the device by the window ! From his part Emile JUMEAU did not remain inactive. He selected a model, size 11, naturally with a open mouth head. To assure promotion and to realize a market research, he organizes a competition with the little girls in " Mon Journal " ( Issue of September 2, 1893). Object of the competition : Which are words, sentences which the small moms would like hearing in the mouth of their baby. Naturally the winner will receive one of the babies speaking Jumeau, to go out at the end of the year. Everything was ready for Christmas 1893. Advertisement was notably been supposed to be in a review of scientific popularization " Nature ", on December 9, 1893, as well as an advertisement appeared in " La Famille" of December 24. "Mon Journal", in the issue of December 30, boosts the interest of its young readers, initially aroused by the big Competition of September. Department stores (in particular, those of La Tour Saint Jacques) received speaking babies' prize, some privileged children saw Santa Claus depositing it in their shoes.... TheJumeau Phonograph Baby (which will become " Lioretgraph Bébé Jumeau " according to the Catalog LIORET) was launched. < < The talking doll. Extracts from " La Nature, Revue des Sciences et de leurs applications aux Arts et à l'Industrie" (The Nature, Review of Sciences and their applications to Arts and Industry). The sound producted was not very strong. 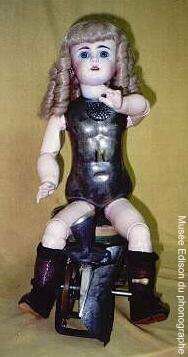 A collector, Paul CHARON (" La Machine Parlante " -The Talking Machine - 1981) learns us that " the most ingenious in LIORET's mechanism is the use of the rib cage of the doll to amplify sound : the box-cornet provided directly with the point reader distributed it only with parcimony. Besides this doll did not allow to up the tone, it had been too well bred for it. This makes that, even in 15 cms, one does not understand a single word of what it says ". Sound did not have to be very understandable neither in first listening for the other persons because instructions , stuck in the lid of the delivery box, recommended " to understand well the first time it's better to read words registered on the cylinder put in the Baby "! 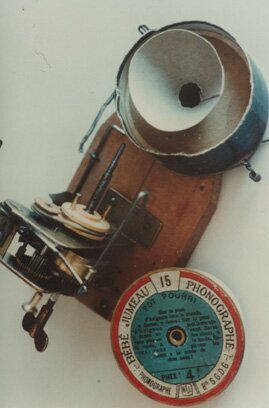 Jumeau improved the technique of reproduction of recordings, and took on September 5 and November 20, 1894 two patents. However that may be, and in spite of the high price (49 F. in the launch, then 48 F.) it was the success, which survived (briefly it is true) at the Firm JUMEAU. The speaking Baby was still in sale at LIORET in 1900. We do not know if the used bodies resulted from stocks realized before the creation of the S.F.B.J. or if the new company supplied LIORET. The other manufacturers interested in Lioretgraph. So Henri VICHY for his automatons " The Pierrot to the well " , or " The Zouave ", or Chocolates MENIER for an advertising Kiosk. After the stop of the production of Lioretgraph, Max Oscar ARNOLD, manufacturer of Dolls to NEUSTADT, near COBOURG, took different patents, for a talking doll, which starts in our country in 1910. She measured 75 cms in height and had mobile eyes and was called successively " Arnola " then " Arnoldia ". The pavilion of the internal "phonograph" was just next to the mouth. Its discs reproduced texts or songs in French, in German and in English. It was in sale until 1914. It seems that functioning let wish when the doll was not straight. -To note, the talking doll possessed a little bit special dress: the blouse could come unfastened easily, to reach the recorded roller. The system echoes that of breeches bridge. It is possible to see this kind of garment on the LIORETGRAPH, to the Museum of GUERANDE (or to look at the photography of it in the "Polichinelle" of January, 1987, n ° 25, p. 19). Another patent was set in 1920 by A.M. NEWMAN, for a small phongraph able to be introduced into a small doll of around thirty centimeters and to work in all the positions. We do not know if this patent was exploited commercially.